Rod and Val Ward ran a model car business in the 1970s from Leeds, UK, called Modelauto, at that time one of the three biggest in the UK, with a thriving mail order side, manufacture of kits and handbuilt models, and distributorships of a number of international model brands, as well as organising the Leeds International Swapmeet. All of these activities required advertising and promotion, but at that time there was no specialist model car magazine in the UK. 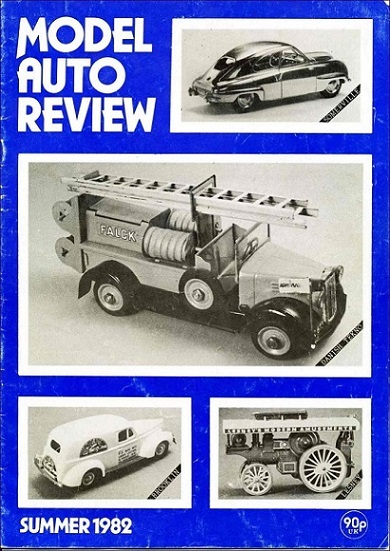 In 1981 it was decided to launch a new A4 size (210 × 297mm) magazine called Model Auto Review (MAR) to be published quarterly and sold through specialist model car dealers, model shops, at swapmeets as well as by mail subscription. The first issue came out in early 1982, and over the next decade it became more frequent, ultimately ten times per year, with more pages and lots of colour illustrations. The aim was to be a journal of record, listing new releases, producing histories of manufacturers and so on. A network of contributors from around the world was built up, among them many renowned experts in their chosen field. After over 20 years in publication, specialist shops began to close in the 21st century and costs of sending copies to subscribers by mail became excessive. The decision was taken in 2005 to change the MAR format to A5 size (148 × 210mm), which made mail subscriptions viable again. The A5 format had already been chosen for a separate series of publications on transport, collecting and popular culture; Auto Review. After 32 years in continuous publication, the last print edition of MAR was published in December 2013, though MAR had for some time had a parallel existence online at www.zeteo.com. From this point onward, MAR Online, edited by Maz Woolley, took over the role which had previously been carried out by MAR as a print magazine. Rod Ward, the original Editor and Publisher, continues as Executive Editor of MAR Online. Then in December 2015 after issues with the web hosting, the Editor found a new website host and updated the format from an online magazine with publishing dates to an online blog format. With the new MAR Online blog, articles are published as received, and so MAR Online carries on into the future at www.maronline.org.uk. Auto Review continues to be published in printed A5 format by Rod and Val Ward and adds about ten new titles every year. Copies are available directly from the publishers or from Oxford Diecast at autoreviewbooks.co.uk.